Having left the beautiful Cusco we got on an overnight bus to our next (if very brief!) 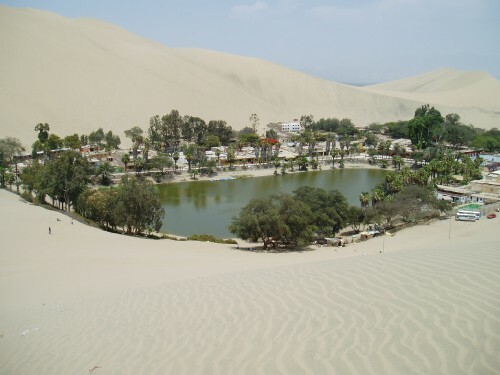 destination, Huacachina! 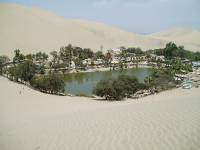 It is essentially a tourist spot built around an oasis in the vast sand dunes. Its tiny and the key thing to do there is the dune buggying and sand boarding. Having seen several injured travellers as a result of sandboarding accident, we decided to do a tour which focused primarily on the dune buggying, and watching the incredible sunsets that come over the dunes. With our driver looking like something out of Around the World in Eighty Days with his goggles on, we set off. The trip was hilarious and the sunset beautiful, most certainly worth visiting if just for that. Our driver advised us if we didnt want to get too far into to sand boarding vibe, to go down on our stomaches. We did so and had an incredible time hurtling down the dunes, although I couldnt help the feeling that we highly resembled baby penguins! Arriving in need of a place to stay and due to it being the Easter weekend, the only beds left were in a 25 m,an dorm. Even for us budget travellers, that is alot of smelly men in one room! From Huacachina we moved quickly through Lima up to Mancora, a great beachy surfing destination! The hostel! Loki in Mancora is more like a hotel resort than a hostel and still really affordable. Its right next to the beach, with an awesome pool (not like most of the other hostel 'pools' we have encountered which are no bigger than a bath, and no cleaner than a toilet), bar, restaurant and to top it off, lots of people we knew to bump inot again!!! Here we saw Berrick, Laura and Kailash, Vanessa and Kazia, Rachel and Kate again, and met Poggy, Mills, Julia and Immy. With a nice reunion on our hands we made the most of the beachfront cocktail bars too! The surfing here is fab, and is defintely somewhere you could get sucked into staying for much longer than a few days. As it was we managed to move on after three incredible nights and a tab kept helpfully low due to Berrick's good influence on our bar tabs! With a brief but busy few days in peru, we left and headed into the cheaper delights of Ecuador!